Liberation HD brings Aveline's quest to home consoles, but it doesn't improve enough to escape the Vita version's shadow. The original Assassin's Creed: Liberation and I have a contentious relationship. I've wanted a good portable Assassin's Creed since the series first touched down at retail. Aveline de Grandpre was the first female protagonist in the series, something that I definitely wanted Ubisoft to explore. And the reality of slavery in her era in relation to her own status as the free child of a former slave intrigued me; I've always felt that Assassin's Creed as a series could be at its strongest digging deep into the conflicts that were present in each era. Despite some solid writing in the latter half of the game, Assassin's Creed: Liberation did not live up to my initial hopes and expectations. It was only an okay game. It's definitely not worth buying a PlayStation Vita for, which is sadly what I did. Liberation HD is a chance for Ubisoft Sofia's AC outing to not be relegated to the PlayStation Vita, a system that hasn't exactly lit the world on fire. The Vita game has been remade with new graphics, improved controls, and new missions in the hopes that players on Steam, Xbox 360, and PlayStation 3 will give Aveline a chance. Liberation HD looks better, but not enough to cover up gameplay deficiencies. The graphics are the main star of the show this time around and Aveline has transitioned over to HD resolution fairly well. Graphically, Liberation HD looks to be using the Assassin's Creed III engine without benefiting from the same lengthy development cycle. Models are improved, lighting is far superior, and the city of New Orleans looks great, but textures can be blurry and uneven at times. The Louisiana Bayou missions in particular do their best to remind you that Liberation was once a Vita game. 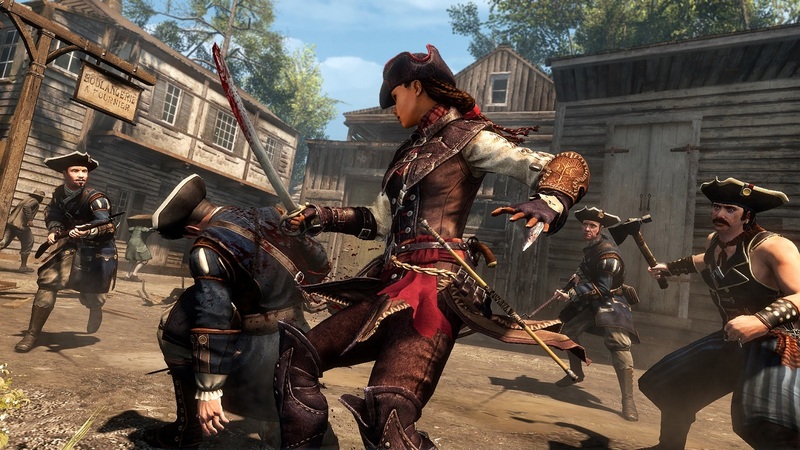 Visually, it's behind ACIII and it sits far behind Assassin's Creed IV: Black Flag's bright Caribbean open-world. It feels like an HD port of a PlayStation 2 game, without the deep, nostalgic love that serves as an impetus for such a port. When I played Liberation on Vita for the first time, one of the things I appreciated was its limited focus compared to Assassin's Creed III. I felt there was a bit of aimless bloat in Connor's game, with the ship-sailing and Homestead not being fully-integrated and the assassination/delivery side missions seeming like an afterthought. Liberation dispensed with all that because Ubisoft Sofia only had so much to work with power-wise, which worked fine on Vita. Liberation is a solid Assassin's Creed game, but the transition to HD did not add enough improvements, tweaks, and fixes to the game's core mechanics. The persona system, which allows you to switch between Assassin, Lady, and Slave personas was a good idea for Liberation, but it had problems in a few areas. It was forced on players much of the time, meaning the switch often wasn't a choice at all. When players were able to choose between personas, the level and mission design didn't provide multiple options for tackling a mission; the Vita's lack of power led to shorter, more straightforward missions overall. The real killer was that each persona had its own notoriety, meaning there was far more management of that mechanic than was worthwhile. None of those issues have been fixed in Liberation HD, sadly. Assassin's Creed III's combat system is still onstage here. Basic movement has been improved with the switch to controllers that have more buttons than the Vita, but the levels themselves haven't been revamped. They lack the satisfying flow found in Black Flag; Aveline's parkour is smoother now, but the playground itself lets you down, especially when you're in the Bayou. Combat is exactly the same as Liberation on the Vita, though the Chain Kill system has been moved to one of the trigger buttons on PlayStation 3 and Xbox 360. Instant-fail stealth missions involving tailing targets and other fun Assassin's Creed throwbacks are still present in Liberation HD, even if the checkpoints have been changed to be more forgiving. Ubisoft also added a new weapon, the whip, but it doesn't factor enough into the game to justify its use. The whip doubles as a melee weapon and a grappling hook, but the more interesting grappling hook side is hampered by the limitation of what you can grapple onto. 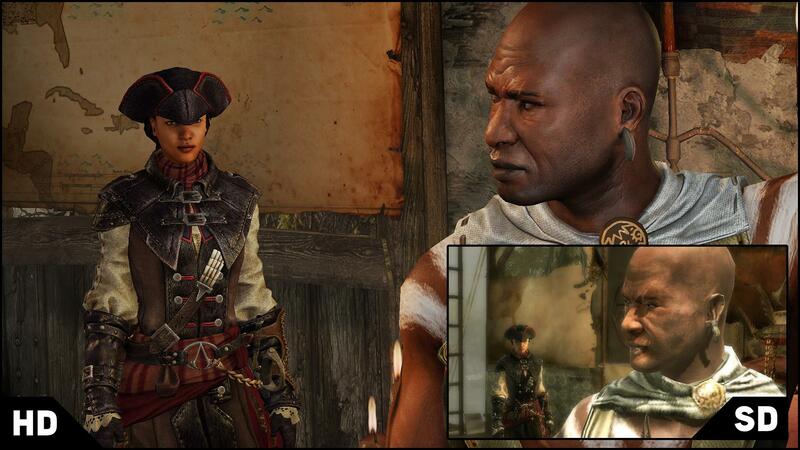 You're frequently better off just using Aveline's natural movements to get where you want to go. Liberation is something I had high hopes for, but ultimately the game let me down by providing an average experience like its tie-in older brother, Assassin's Creed III. Liberation HD brings the game to a higher resolution, but the HD graphics shine a harsh light on what wasn't improved in the game. I feel like if Liberation HD had come out prior to the vast improvement that was Black Flag, I would've been happier with it, but it didn't. It hurts when something you want to wildly succeed ends up being just okay. Despite Ubisoft Sofia's clear effort in improving Liberation HD, it's still just average. If you've played Liberation the first time, you probably don't need to double-dip. If you haven't played it, but you're hungry for more Assassin's Creed, it may be worth the $15-20 asking price. I'd err towards the $15, so look for it on sale if you can (the game is cheaper if you've purchased ACIV's Season Pass). I hope Ubisoft gives Aveline - or even other non-male or minority Assassins - a chance in the future, but Liberation HD isn't the home console outing she deserves. A host of graphical improvements and some new missions can't hide the fact Assassin's Creed: Liberation HD needed to do more to bring the Vita game closer to the outstanding Black Flag. Ubisoft Sofia did what they could, but the resulting game is still an average, limited Assassin's Creed experience. If you haven't played it, try a demo. If you have, there's no reason to play it again. Tagged with PC,	PlayStation 3,	Reviews,	Ubisoft. What Are The Best Settings in the Assassin's Creed Franchise? This isn't about the games, it's about the worlds they inhabit.